Imagine, a snow experience that only requires one major investment and pays off in endless days of snow and untouched tracks away from the masses. Close your eyes and listen to the silence, see the fresh lines and unlimited supply of scroggin’ that is just waiting to be scoffed once you gain the next ridgeline. Yes, I am talking about backcountry skiing and snowboarding and no, scroggin’ or ‘fruit and nut mix’ is not a necessity, but it is advised. Since the dawn of the sport, skis and now snowboards have been used as a mode of transport. Hunters in Scandinavia pioneered the mode of transport by securing animal skin to the bottom of wooden sticks to glide up and down snow-covered terrain. For the last few generations this technology has been used to explore far off places, race up mountains and occasionally ride first descents. However, this style of riding was generally used for mountaineers and hikers who were more interested in going places in a fast fashion with lightweight gear, than shredding laps of freshies and riding lines. Luckily, that is no longer the case and as you may have seen in ski films by Sherpa’s Cinema, Sweetgrass Productions and let’s not forget, the Jeremy Jones trilogy, the concept of hiking and ‘earning your turns’ has now been bought to the masses. This has only been accelerated by new technology and an emphasis on light hiking gear that can handle rowdy lines and hard shredding. WHY WOULD I HIKE WHEN I CAN TAKE A CHAIRLIFT? It’s a valid question, especially if you’re not lucky enough to spend the whole winter getting hiking fit. Sometimes riding a chairlift is hard work as it is. 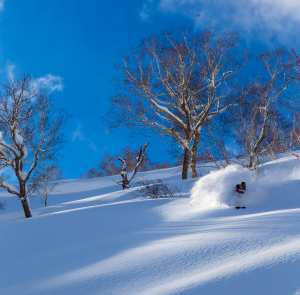 However, ski touring can offer you something that is a lot different from your average day at the resort. Costs of ski touring after the primary investment in ski touring set-up, skins, full avalanche rescue kit and a delicious picnic lunch (scroggin included) are pretty much nil, especially when you start comparing them to the price of lift passes in the southern hemisphere. The benefits of riding out of bounds are endless: stunning scenery, untracked snow and a whole lot of time to take in the serenity. There are limitless terrain options, you can shred the mountain the way you think it should be ridden and not be dependent on where the next lift access is located. You don’t even need to fully boycott chairlifts, many resorts have backcountry lift pass rates so that you can have speedy access to rad ski touring just a little hike out of the resort. Ski touring set-ups are international and versatile – you can travel the world with one set of skis, riding the resort one day and shredding in the backcountry on the next. However, for me, the addiction to ski touring didn’t happen as a result of whether it was more economical or even for the fresh tracks – it was the feeling of empowerment that got me hooked. From the first time I slipped into a pair of touring bindings, I felt 100% independent from everyone outside of the small crew that I had gone backcountry with. Our team got to decide which direction we walked in, we chose the route and for a little while we were all alone in the mountains, dependent only on our own decision-making and riding skills. It’s not everyday that you get such a special experience with the added bonus of skiing thrown in. OK, SO I’M CONVINCED, HOW DO I MAKE SCROGGIN? Hold your horses there friendo, let’s talk getting experience and gear before we get into snack recipes. First of all, the majority of ski touring usually happens outside of ski resorts, that is in the ‘backcountry’. 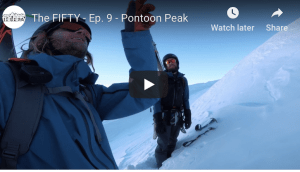 As any avid backcountry user will quickly tell you, it is necessary to have some kind of backcountry and avalanche awareness before you step out into this territory. 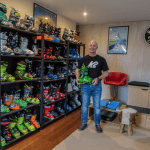 While New Zealand has a great culture of backcountry skiing and avalanche education, in Australia this is not so much the case. 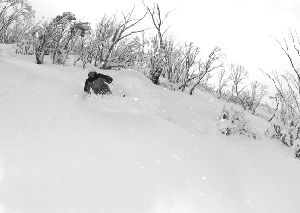 As Zack Wasson recently discussed in an opinion piece, The Darker Side of the Storm, while Australia does not host prime conditions for avalanches it doesn’t mean that they don’t occur. Knowing how to deal safely with avalanche conditions, ice and variable snow while hiking and riding, as well as emergency situations, are all things that any backcountry rider needs to know. 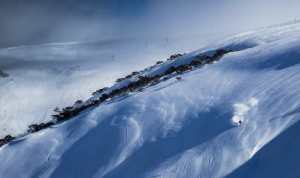 Get educated, learn about backcountry skiing styles and techniques and get yourself enrolled in an avalanche awareness course – there are several options for Avalanche Level 1 courses in Australia and NZ. Know before you go, check the weather, snow conditions and if possible the avalanche report of the specific areas you plan to visit. Find a good crew of ski friends that you trust and who have also taken the time to educate themselves about backcountry riding. If it’s your first time, start slow, potter around near a resort, learn how your gear works, practice transitions between skinning and skiing, using your avalanche rescue gear and safety techniques such as self arrests. There are lots of great guided ski touring trips you can be a part of all over the world – so if you’re keen to get into hiking, maybe choose a week of guided backcountry ski touring instead of a week at the resort on your next holiday. Now this is where it becomes tricky, as there are all types of wonderful gear that could send you well on your way to a great trip in the mountains. First of all you need to decide what style of riding will you be doing and in what type of terrain. Most ski touring set-ups can be divided into two categories, performance uphill (light) and performance downhill (heavy). In most cases the weight of your set-up will usually depend on what type of binding you choose. At this current point in time, a lighter touring binding like your Diamir Freeride Pro or Marker F10 is designed for performance in both up and downhill but for the heavier or more aggressive skier, they may find it lacking when it comes time to send a line or hit drops. On the other side of the scales are your Marker Dukes or Salomon Guardians of the world, which have a nice healthy DIN setting anywhere up to 16. However, with almost two kilograms difference in weight, the walk uphill will be a lot more work. The length and weight of your skis can also make a difference and in this case there can be a choice between ski performance, for example: a fatter, stiffer ski vs. a lighter, softer ski. The creation of the Dynafit-style ‘pin’ touring binding that couples a light-weight binding with one that has a high level DIN and can take on hairy terrain. Several brands have developed their own pin bindings in response to this including the Marker ‘King-Pin’, Diamir Viper and Plum Yak, just to name a few. This style of binding is the future of the sport as it is now possible to have one ski with a binding that can deal with backcountry and in-resort snow and terrain. The ski boot walk mode. This technology has been around for a long time but brands are now putting walk-mode in stiffer alpine boots, meaning that it is no longer necessary for skiers to have to use a softer ski touring boot to make the long, uphill strides. It also means the end of blisters (well that is if your boots are well fitted). The split board has revolutionised backcountry riding, as now it is no longer necessary for snowboarders to rely on snowshoes to make it up steep and deep terrain. This however is not my area of expertise and I’ll leave it to Riley Bathurst to make the comparisons. So there you have it, the ins and outs of scroggin munching. The best part of it is that even though winter is coming to an end, ski touring season has only just begun. Spring is the time for your fruit and nut lovers everywhere. So take the opportunity while it’s here, enjoy the spring corn and be safe out there. ( Add lollies or more dried fruit if you think you’ll need an extra sugar hit).